Young Artists is a visual arts school based in Castle Hill of the Sydney Hills District. The Young Artists Art School provides programs and school term art classes for preschoolers, kindergarteners and teens, catering for all abilities and interests. We also host special art workshops in the school holidays for children between 5 and 18 years of age and fun themed children’s art parties (fabulous fairies, pirates, Pokémon, mad monsters, flower power parties and more). Young Artists’ programs and art lessons have been designed to give students a rewarding art experience in a nurturing, creative, and inspiring environment. We develop technical skills in drawing, painting, mixed media, printmaking, collage, clay, sculpture, ceramic painting and glazing. Our programs and art classes give students confidence by allowing them to experiment with a wide range of media. We teach art terminology and help students recognise their own strengths and weaknesses as artists. Programs and art lessons also change from term to term, meaning students stay interested, and challenged. 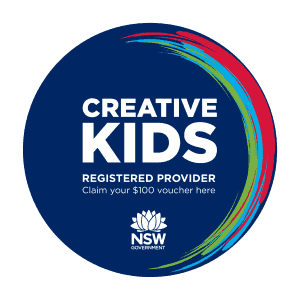 If you enrol more than one child in Young Artists art classes for a 10 week term, you will receive a 10% discount on the second child (excludes preschool, kindergarten and drawing art classes). The children at Young artists are given opportunities to enter art competitions. We would like to congratulate the children who won awards at the 2019 Castle Hill Show and the Sydney Royal Easter Show Arts and Crafts Exhibition.